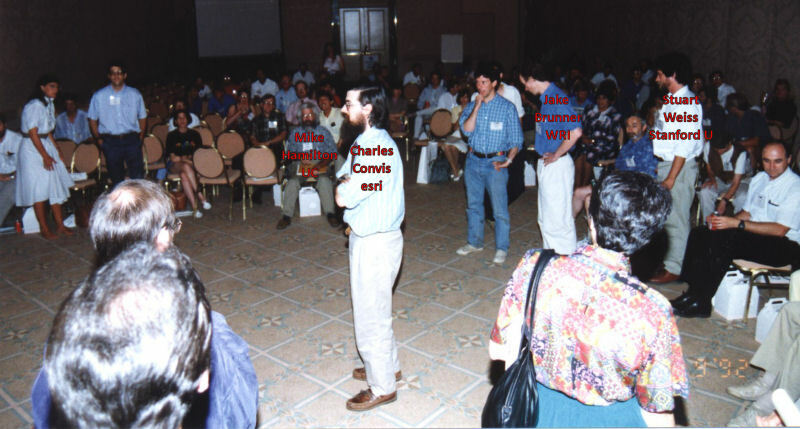 " It is now 4 years since I came to ESRI and 3 years since I started the conservation program around the 1991 user conference. Since then we have grown into a network of over 150 organizations, making over 600 separate donations and scholarships to support your GIS work. This is also the first year that I have finally been able to take time off from "priming the pump" to actually dive in and conduct a GIS-Biodiversity project myself. I was hired (as an ESRI consultant) by the World Wildlife Fund/Biodiversity Support Program to handle the GIS side of a new National Biodiversity Planning effort for Bulgaria. We worked with three scientists to train them in Arc/INFO and digitize in some 52 maps they had brought representing the work of nearly 30 bulgarian scientists. We then returned to Bulgaria for a national workshop to develop a national conservation plan. I was pleased to see that with only a couple of weeks training in Arc/INFO and Arc/View, the three scientists conducted all of the GIS presentations by themselves, showing analyses and responding directly to questions from the floor using live data. Remember, they had never worked with a GIS prior to 3 weeks before. This entire project is based on PC-technology and continues to thrive. As if there were any doubt, I think this proves that GIS and Arc/INFO can be an appropriate technology at the local level, but only if the end users are put in the forefront right from the very beginning. The hardest thing as a teacher is to let people work out problems and make mistakes for themselves, but it is the only way to achieve learning which is permanent instead of learning by rote. Speaking of doing it yourself, the Conservation program has grown well beyond my ability to manage it well, and so this year I am encouraging all of you to start thinking about how to develop an independent organizational structure, maybe a non-profit association. Marshall Mayer of Desktop Assistance has kindly offered to host a meeting Tuesday Night to discuss forming yourselves into a national or international consortium, for the purposes of applying for grant funding and for forming partnerships for collaborative work projects. About all I have managed to do is finish the database of all Conservation Program members, and I hope to have each organization's data printed out so you can verify it and add to it. This will also help you to contact each other rather than trying to track me down for names and addresses. The design is fully relational, and will tie into a database of conference papers as well as any other publications you care to name. Another event that I am very happy about is the involvement of First Nations in this year's conservation program. I have always felt that conservationists and native peoples held the closest of all alliances, ever since I realized that organized western religion had nothing to offer me, but the trees and rocks and grass? now there was all the spirituality and meaning a guy could ever need. I find it puzzling when I read about local disputes over reservation land use practices and conservation issues, since these are two halves of the same coin. I feel that modern conservation biology and tools like GIS explain the mechanics of ecosystems, and traditional beliefs and practices explain why, and tell us about the human role in the ecosystem. Belief without practice is ineffective, and practice without belief denies our humanity. Let us all welcome each other to this conference, and look beyond superficial differences to explore ways to unite these different worlds, with a little help from our maps and GIS tools. Mon: Conference opening session with welcome by local Aquas Calientes Tribal Chairman Richard Milanovich. Tuesday noon-1pm: welcoming lunch by the Aguas Calientes tribe to conservation workers and tribal members from far and near. This will include another appearance by the Birdsinger Dancers, who were a delightful presence at last year's conference, depicting Aguas Calientes Tribal History in dance form. Wed Lunch - Native American Roundtable: This will be an informal lunch to which anyone is invited to discuss current GIS-related issues and concerns for native americans, including resources management, education, and cultural affairs. Wed Evening - Conservation Potluck at James Reserve with closing ceremony. The James Reserve is a private nature reserve and we are priveleged again this year to be able to make use of it, thanks to Dr. Mike Hamilton. Everyone is invited, especially those with an interest in conservation and Native American issues, but because of the restrictions, we request that those wishing to attend come by the Native American Sessions room after the last panel session to pick up a map and a form with the reserve rules, and to arrange carpooling or obtain a ride if you need one. The reserve road is passable by 2WD, but since it is difficult we respectfully request that you avoid driving if you are tired or have had anything to drink, in order to avoid another accident on this road.